Posh celebrate their Wembley win in the 2014 Johnstone's Paint Trophy Final. Peterborough United will face Millwall away in the first round of the Johnstone’s Paint Trophy. The draw was made live on Soccer AM this morning (August 8). The game will take place the week commencing August 31. 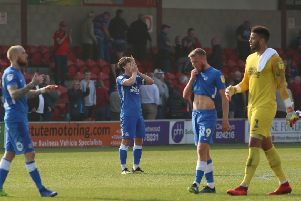 Posh won the JPT Final with a 3-1 win over Chesterfield at Wembley in 2014 but were beaten in the first round last season, 3-2 by Leyton Orient at the ABAX Stadium.